Amanda Palmer and Jason Webley are Evelyn Evelyn. 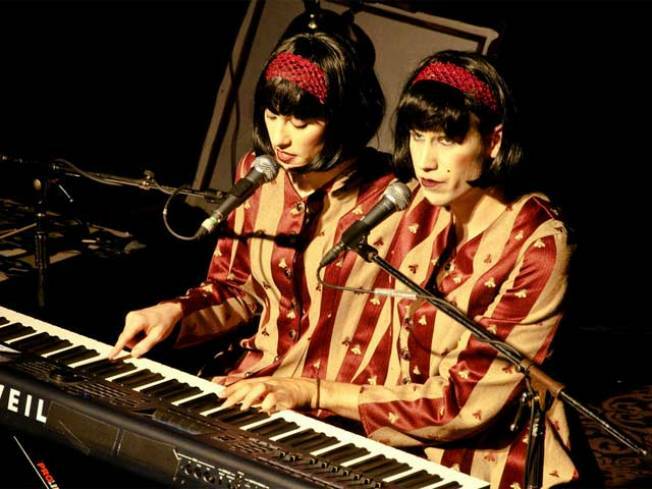 Evelyn Evelyn, ICYMI, are a fictitious pair of conjoined female twins who grew up in a circus and were “discovered” by neo-cabaret queen Amanda Palmer and Jason Webley, a sort of young Tom Waits gypsy-punk minstrelish type who rocks it on the accordion, among other instruments. Don’t waste any thought on this backstory—all we know is they’re at the Lucille Lortel Theater through Saturday, and by God, you should go. The freakshow fantasia falls aside the second a musical instrument appears: Palmer and Webley may be playing the faux backstory for twisted laughs, but they’re playing those instruments—each artist using the one hand that’s not concealed—for real. There’s been a lot of huffiness and controversy about the project’s potentially dubious premises (i.e., faking disability for art), but we’re pretty sure those doing the huffing haven’t actually experienced the show or considered what it’s riffing on (i.e., actual circus freakshows, which have a storied, and fully disturbing, place in the showbiz canon). It’s a little gobsmacking and terrifically inventive. Sonic performance artist Sxip Shirey joins. Shows start at 7PM, every night through Saturday June 12. Tickets via TicketCentral.